Are you sick and tired of filling up your home with harsh chemicals and fumes from commercial furniture polish sprays? Want a cheap and simple way to clean, protect, and moisturize your wood furniture? If this sounds like you, you need to start using homemade furniture polish. Have you noticed your coffee table or other wood furnishings looking dull or hazy? If so you are not alone. Over time, commercial polishers leave behind a nasty buildup. Most commercial furniture polishes, such as Pledge and Swiffer, have a poor recipe rating and contain silicone as an active ingredient. The silicone causes the buildup as it bonds to itself. Every time a new layer of polish is applied dust becomes trapped between the layers giving your furniture that dull, hazy appearance. Homemade furniture cleaner will clean, protect, and shine your wood furnishings without grabbing onto all of the dust floating around the house. Save money with natural furniture polish as it only costs pennies to make and is often made with products you already have around the house. Before you start using homemade furniture polish you want to remove water stain from unfinished wood and rid your furnishings of any buildup. Flannel baby wipes are the best method of application for this DIY furniture polish recipe, but any microfiber cloth will work. Furniture spray should be stored in a cool, dark place and replaced monthly. Add all ingredients into a plastic spray bottle. Spray cleaning solution directly onto a soft cloth and wipe down furniture. If you are after more gloss, spray the product directly onto the wood surface and buff to a shine. This recipe not only polishes your furniture, but it picks up the dust as well. For those who don’t like to spend a lot of time cleaning, this is excellent news, as it allows for less work. Most people opt for a lemon essential oil, but you can use others based on your preference of scents. Find a container with a tight-fitting lid, such as a 4-ounce mason jar. Place all ingredients into the jar, secure the cover, and shake until the oil mixes with the vinegar. As oil and vinegar naturally separate you need to shake this solution before each use. Use an old sock or another soft rag to dip into the polish. Rub the polish into your wood furnishings. Store the product in a cool location away from sunlight. Replace monthly or when it starts to smell bad. Using oils that are not food-grade, such as jojoba, will allow you to store your furniture polish longer as non-food grade oils have a longer shelf life. These amounts can vary based on how you want the consistency of the polish. Oil adds lubrication to the polish, but too much can leave the furniture with an oily feeling. Adding vinegar increases the cleaning power of the polish. To apply the homemade furniture cleaner, dip a clean rag into the polish and rub onto your wood furniture. Always rub the products in the direction of the wood grain. Once polish has been applied, allow the wood to air dry. This scented furniture polish will leave behind a pleasant citrus scent. How big a batch you make depends on the size of the furniture you are polishing. In a glass container to prevent the lemon juice and oil from breaking down the plastic, mix lemon juice with lemon oil and either jojoba or olive oil. Dip a rag into the polish and rub with the grain onto your wood furniture. No need to wipe the polish off, merely allow it to air dry. When making your own furniture polish with food grade oils, you need to store them in a cool, dark place. Food grade oils, such as coconut oil, do go rancid so replace the polish once a month or as needed. Melt the coconut oil on low heat and pour into a spray bottle. Add distilled white vinegar and lemon juice, and then shake to combine. Shake bottle before each use, spray directly onto furniture and wipe down with a clean cloth. Nothing beats being able to clean and polish your wood with a single cleaner. If you don’t have lemon oil on hand, you can use lemon extract in its place. This recipe can be stored in a container or a spray bottle, depending on how you wish to use it. If stored in a container pour the natural furniture polish directly onto a dry cloth. Work the cleaning products into the wood making sure you wipe in the direction of the grain. You will immediately see the beautiful shine return to the wood. If your wood table is extremely dry, allow the product to sit on the wood and then go over it a second time. Massaging petroleum jelly into the wood will also help restore it, but it must be buffed out with a dry cloth. This all-purpose cleaner that uses only natural ingredients reminds many of us of salad dressing, but we don’t recommend eating it. This cleaner is so good it can even be used when cleaning patio furniture. Add all the ingredients into a bottle fitted with a spray top. Shake the bottle gently to mix the ingredients. Spray the cleaner directly onto the furniture and then wipe clean with a microfiber cloth. The spray is also safe to use on leather furniture. If you are interested in healthy living and want to use DIY cleaning products in place of commercial household products, making your own homemade furniture polish is just the first step. Caring for your wood furniture is easy if you follow these useful cleaning tips. 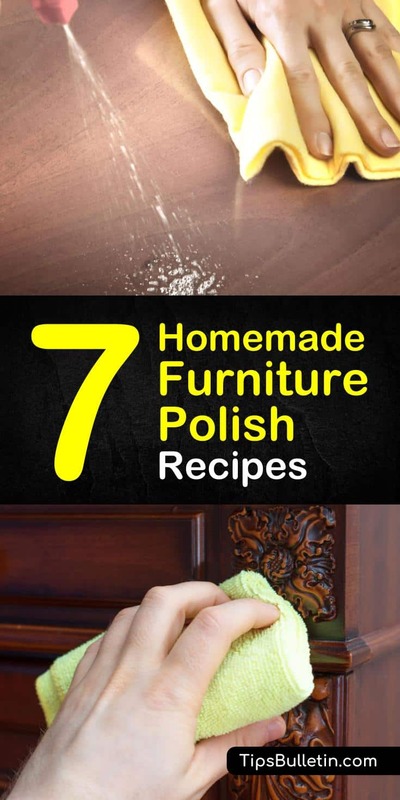 If you found any of the homemade furniture polish recipes helpful, please take a minute to share these cleaning tips with others who might find them useful. You can share on Facebook or take a minute to pin it on Pinterest.